Hildegard of Bingen (1098 – 1179) an influential and creative Benedictine abbess from the Rhineland lived at the time of the building of Chartres Cathedral, the evolution of the University of Paris and in the lifetimes of Eleanor of Aquitaine, Thomas a Becket, Fredrick Barbarossa and Bernard of Clairvaux has been an influence on my artwork – the self portrait and portrait. Hildergard has been described as a poet, artist, musician, scientist, administrator and visionary. In her life time she challenged civic and religious leaders through her writing. This self portrait could also be seen as part democratisation of an artform , the selfie of its era. 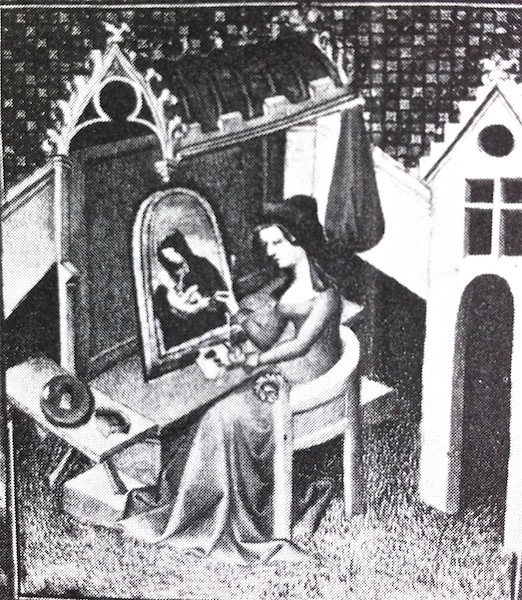 While Hildegard may not have painted this self portrait illumination herself its contents and concept were hers and she would have directed its execution. It shows flames of inspiration arising around her head as she writes watched by her secretary and monk, Volmar. A private instant of conversion “in the process of” self expression freeing her from writer’s block, doubt, subservience and illness due to cultural constrictions. 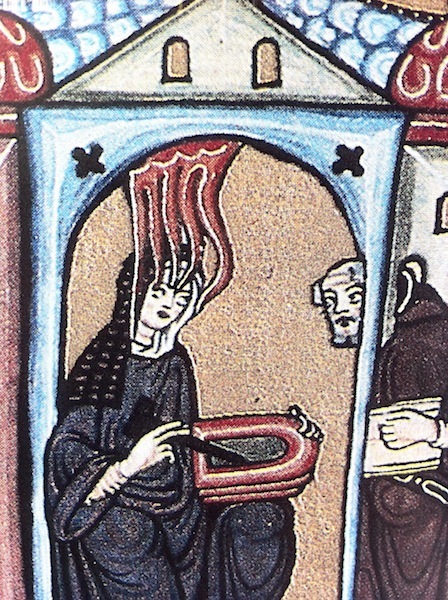 Society thought that women like Hildegard exceptional but at the same time the profession they pursued was deemed masculine. Christian representations of women in the Middle Ages were focused on the opposition of Eve and Mary, seducer and saint. Images of creative women (below) from Antiquity however were acceptable as examples of exceptional persons but distinct from the experiences of everyday women. Hildergard’s images of self expression and the depiction of the process and technique of producing the image seemed unusual in an era when “doing your own thing” was centuries away. 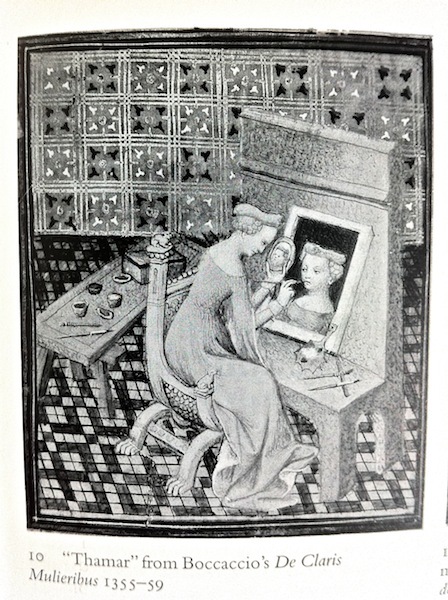 Self portrait “Thamar” from Boccaccio’s De Claris Mulierbus 1355 – 59. Anonymous, Thamyris Painting, early 15th century manuscript. These images showing women as persons aware of their self identity at that time were truly revolutionary and inspiring. Categories: Preliminary photographs | Tags: art history, Hildegard of Bingen, illuminated manuscript, inspiration, portrait, self portrait | Permalink.